Having completed service with Color Line at Oslo on the morning of 31st August, the vessel was taken over the same afternoon by an Irish Ferries crew and sailed for dry-dock at Fredericia Skibsvaerft A/S in Denmark, where she arrived on 4th September for an extensive refit. The vessel was also fitted with a second bow thrust unit for improved manoeuvrability in port, new smoke alarm systems and a full overhaul of the sprinkler system. Work on the passenger areas included the construction of two new state of the art 55-seat cinemas, the restyling of restaurants, bistros, lounge bars, children’s play areas and other passenger facilities in themes that reflect the link with Oscar Wilde, including a major upgrade to the cafeteria – the Left Bank Brasserie. Other items include the fitting out of a new hair & beauty salon, revamping of the main reception area, the provision of 130 new reclining seats, the fitting of new passenger information signs and the re-branding of the vessel in an Irish Ferries livery. Having sailed from Fredericia on 17th November the Oscar Wilde undertook berthing trials in Cherbourg and Roscoff, before heading for Pembroke Dock on 20th November. She reportedly attained a speed of 26 knots between Cherbourg and Roscoff. The Oscar Wilde arrived in her new home port of Rosslare at 10.45 am on 21st November where she completed EU Host Nation drills. Liveried in blue hull with the Irish Ferries â€˜waveâ€™ logo, and a white funnel with the companyâ€™s house flag, the Oscar Wilde entered service with Irish Ferries with the 16:00 sailing for Cherbourg on 30th November 2007. With her introduction customers were offered a vastly superior level of comfort and facilities than those available on the Normandy, as well as shorter crossing times. The main passenger deck is Deck 7. Facilities are lounge bars at both ends. Forward is the Merrion Lounge, whilst aft is the larger Gaiety Lounge, both with entertainment facilities. The starboard side features a wide and imposing passageway, with seating and tables along the vesselâ€™s side. Off this walkway are the Berneval waiter service restaurant, the Steakhouse, the CafÃ© Lafayette, Oscarâ€™s Piano Bar, a games zone and a childrenâ€™s play area. There is a central staircase towards the bow, and on the port side the tastefully appointed Left Bank cafeteria. Deck 5 is the location for the information desk and themed foyer, off which are the hair and beauty salon and the shipâ€™s shop. Cabin accommodation is situated on Decks 5, 6, 7, 8 and 9. Each cabin has ensuite facilities, and there is a wide choice from 2 to 5 star, and additionally suites. On Deck 10 are reserved seating lounges, and the shipâ€™s 2 cinemas. Deck 11 features a service point which will lend itself to sales of ice creams and snacks, situates as it is in the centre of the upper sun deck. The bridge is situated on Deck 9, and Decks 3 and 4 are vehicle decks, with an internal ramp for accessing the upper deck. Internally, the vessel is light and airy and virtually all evidence of Color Line ownership was gone. Money had been spent to the extent that if not â€˜in the knowâ€™ passengers could form the opinion that the ship had been built for its new owners. This was very much in contrast to the Normandy right up to her final sailing with Irish Ferries. The inaugural voyage of the Oscar Wilde was eventful but reassuring. Under the command of Captain Brian Gordon, she sailed from Rosslare 70 minutes behind schedule on 30th November 2007 with approximately 700 passengers on board. Soon she was coping with a south westerly force 9 severe gale, and waves of up to 6.7 metres. Having rounded Landâ€™s End at 01:00 on December 1st, she made 21 knots and arrived on schedule at Cherbourg at 11:30. The return crossing also departed late, some 65 minutes behind schedule. Heading into the teeth of a force 10 storm and waves of up to 8.7 metres, Landâ€™s End was passed at 07:00 on 2nd December, average speed from Cherbourg having been 11 knots, with passenger comfort in mind. Heading for Rosslare, the ship achieved 20 knots with ease, and 20 miles off the Tuskar Rock light was still coping with 8.2 metre waves and winds in excess of 100 km/h. The vessel had been tested under about the most severe weather conditions possible, and had not been found wanting. 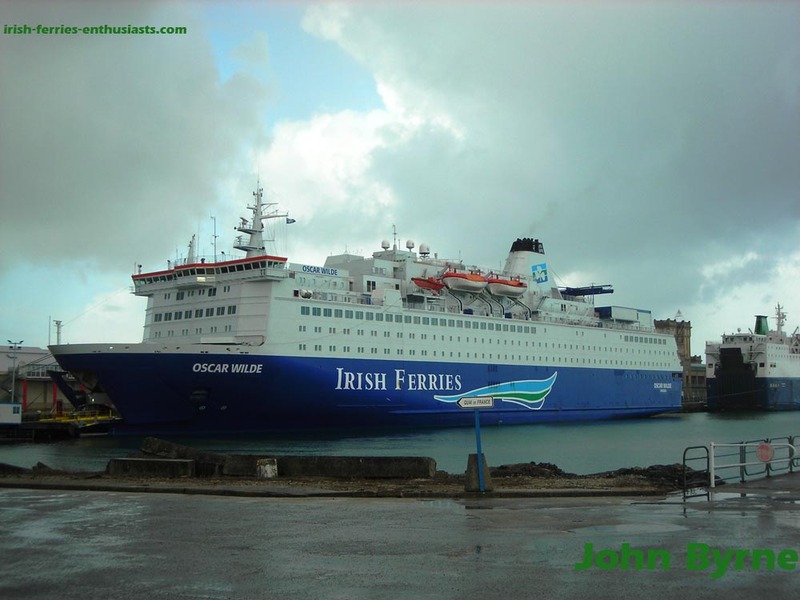 It was proven that with Oscar Wilde Irish Ferries had the vessel which they needed for some years to come. She continues in service on the Rosslare â€“ Cherbourg run until 22nd December 2007, and will stand in for the Isle of Inishmore as she and the Ulysses dry dock. In late January 2008 the Oscar Wilde will be shown to the media and travel trade in Dublin, before resuming service to and from France in early February. In Janurary last year Irish Ferries spent â‚¬45 million on acquiring the 31,914 tonnes ‘Kronprins Harald’, and following a â‚¬5million refit she entered service last November. Everyone that has travelled on her since that I have spoken to has talked highly of her, so I decided it was time for my own trip on her. Following four and a half hours of busses, i arrived in Rosslare at 13.00, and checked in at the Irish Ferries desk in the terminal, then onto the departures lounge. Boarding commenced at 15.10 for the 16.00 sailing. Foot passenger boarding is via the walkway to berth 3, and the gangway emerges onto Deck 5 and the reception area. Deck 5 also has a large shop and a Beauty Salon added by IF during her refit. The rest of this deck is cabins and crew areas. The main staircase and lifts near reception take you to the rest of the ship. Deck 6 is mainly cabins with a freight drivers lounge and Deck 8 is all cabins. Deck 7 is the main passenger facilities deck. Starting aft is the Gaiety Lounge, one of her two main bars and which had 2 lads playing guitar, a singing group, and a magician on stage as i passed through a few times during the night. There is also a casino table near the entrance (which didnâ€™t appear to be doing much business!). Moving forward from the Gaiety Lounge, along the Scandinavian style starboard arcade,(with a range of leather settees and seats around tables), first is Oscarâ€™s Piano Bar which has small gaming areas to each side. Next is the Berneval Waiter Service Restaurant followed by The Steakhouse. The shipâ€™s main stairwell is next with the Left Bank Brasserie (self service) to port. Continuing past the stairs on the starboard arcade is the CafÃ© Lafayette which is a round the clock snack bar finally leading into the forward bar, the Merrion Lounge which although big is clearly a more restful lounge than the Gaiety Lounge (with a view over the bow, and TVs showing RTÃ‰2 most of the night). Deck 10 has been converted into a reclining seat lounges and the ships cinema while extensive outside deck areas including a sun deck with a bar (marked on plans as Deck 10, but is actually Deck 11). I droped my bags in my cabin, then went outside to watch our departure from Rosslare. Loading was complete at 16.15, and Captain Grace announced we would soon be heading so sea, and that a late arrival in Cherbourg was expected due to heavy swells and a force 8 head wind in the Celtic Sea. By 16.20 the lines were dropped and we proceeded out the harbour passing LÃ‰ Emer and the Granuaile III anchored outside the harbour. Once passed Tuskar Rock I headed to the bridge, where Captain Grace discussed how the ship was settling in, the modifications Irish Ferries made to her and went through the background of the various systems on board. During the course of the voyage I met all the ships officers and they all spoke very highly of the ship, and told me about life onboard. At about 19.30 I decided to grab a bite to eat, and took some pictures of the public areas. I later headed to the (very quiet) Gaiety Lounge (and was surprised to see 3 dolphins hopping around!). By 23.00 I headed outside to get some night shots and I retreated to my cabin for the night. I then headed for the Engine Room for a tour. The Engine Control Room, and the engine room are the only part of a ship that I had never been in. One of the engineers was delighted to explain what they do and showed me the various monitoring systems. I was then given a tour of the engine room itself. I then grabbed my bags and headed to an area on Deck 11 overlooking the bridge for our arrival at Cherbourg. A container vessel followed us in, with Brittany Ferries Cotentin sneaking in ahead of us. The Cherbourg pilot boarded at 12.15, and we passed the outer breakwater at 12.25. We docked on Quai de France sliding in behind the Normandie Express. The Oscar Wilde is in excellent condition for her age, and Irish Ferries have made her their own. She handled a very rough sea well, and was carried a full load out. I have also never met a crew that were so proud of their ship, nor so enthusiastic about the job at hand. My thanks to Captain Grace and his crew for such an excellent trip.